There’s no better place to learn arboreal climbing techniques than up in this treehouse! 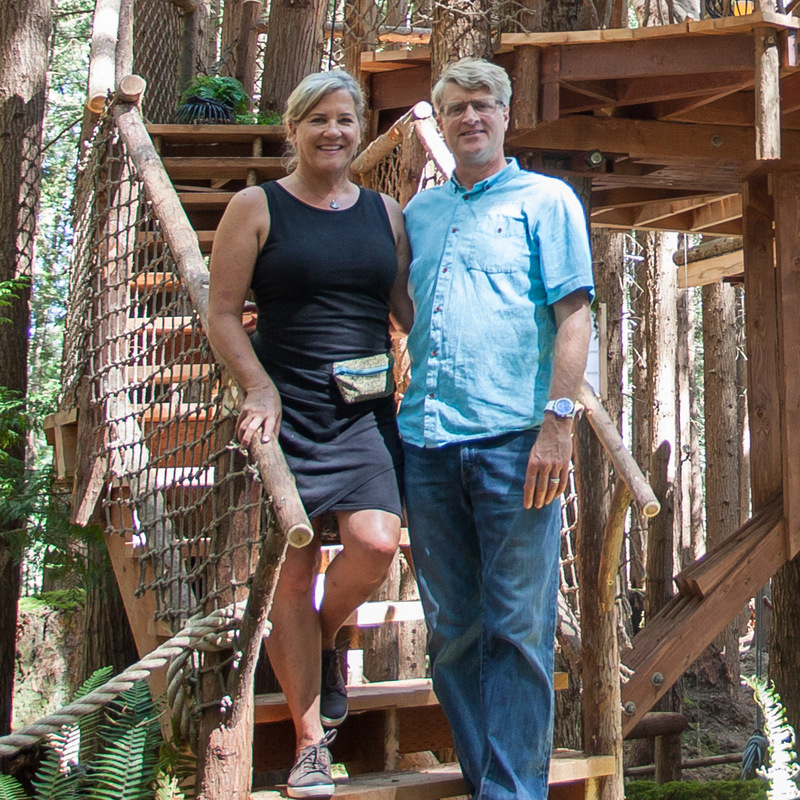 Shelly and Bill attended one of Pete's treehouse workshops several years ago and fell in love with life up in the trees. After the workshop, the couple founded their business to teach others tree-climbing techniques. Shelly and Bill asked Pete for a treehouse that could do double duty as a climbing classroom and relaxation space. Ron, Shelly's father, offered his forested property in Kentucky as the home for the climber's cottage - the treehouse will bring future generations of their family together to enjoy nature on this beautiful land. Pete included seventeen-foot-high timber-framed ceilings with beefy beams strong enough to hold multiple people in climbing harnesses. These sky-high ceilings provide ample space for scaling ropes. Modular furniture allows the room to double as spacious classroom and cozy living space, while a wood-burning stove keeps it all warm. Two barn doors open to a wraparound deck so that the climbing classroom can flow directly into nature. The crew built this timber frame as a stylistic nod to barns in the surrounding Kentucky countryside. Timber frames are extremely strong and can easily hold the weight of climbers dangling from beams. Two enormous barn doors open to the wraparound deck. Oak and maple trees support the treehouse. Pete and the crew installed twin yoke bridles (a.k.a. "howler" brackets) around the smaller trees so that the weight of beams would be equally distributed around each. This way, even the thinner trees can function as solid supports for the structure. To tie the treehouse to the property's history, Pete integrated reclaimed tobacco stakes from a nearby barn as pickets for the deck railing. Inside, climbing ropes hang from ceiling beams. A comfy seating area, kitchenette, ship's ladder, and bedroom loft make it a perfect place for relaxation after climbing class. Large windows bring in lots of natural light. Pine wood car decking adds a warm glow to the interior. The ship's ladder leads to a cozy bedroom loft. Exposed timber framing is both beautiful and functional, as it easily supports the weight of climbers. Pete crafted this table from reclaimed barn wood. Shelly and Bill's treehouse looks like it's floating on air! The crew had a wonderful time working on this arboreal climber's cottage. Thanks for an inspiring build, Shelly and Bill! We wish you generations of laughter and love in the trees! To stay updated on all things treehouse, follow us on social media and subscribe to our newsletter.